For about as long as there have been ergs, there have been people racing on ergs. But for as long as people have been competing in ergattas, there had never been a formally recognized world championship—until this year. During Presidents’ Day Weekend, more than 2,500 people competed in the inaugural World Rowing Indoor Championships in Alexandria, Virginia. Although this year’s event bore new significance, it was hosted by veterans of the erg race circuit. For more than 30 years, T.C. Williams High School has played host to the Mid-Atlantic Erg Sprints, which has become one of the country’s biggest indoor rowing events. It’s easy to see why. Participants range from under 10 years old to over 90, and a selection of alternative races mean athletes can race as much (marathon) or as little (500m) as they like. In retaining the beloved Mid-Atlantic events while growing the size of many others, the race organizing committee shifted to a two-day format for 2018. With over 1,000 entries in youth rowing events, the first day of the World Rowing Indoor Championship was highlighted by performances from some of the nation’s best junior rowers. James Wright, a senior at Philadelphia’s Germantown Friends School and 2017 Junior National Team member, found himself in third place as he entered the final 500m of the junior boy’s event. Competitors from Russia and Germany held narrow leads before Wright made his move. “When that 400 mark came running up to me, I know I need to shift down to a 1:30, and then after that, I was kinda like either I go now or I go home,” Wright said. The Stanford University commit clinched the inaugural junior men’s world title in 6:08.7. His counterpart in the girls’ event, Elena Collier-Hezel from Buffalo’s West Side Rowing Club, has her own national team ambitions. A junior, she crushed the open girl’s field in a personal best of 7:04.8—with 13 seconds to spare. “I heard that there were gonna be some college coaches here, and I also kind of wanted to catch the eye of the national team if I could,” she said. Odds are a number of eyes will be watching Collier-Hezel from now on. The girl’s lightweight races saw a determined Delaney Evans, from Y Quad Cities Rowing in Iowa, earn the gold. After missing a medal at C.R.A.S.H.-Bs last year by five meters, she admitted she was a little nervous coming into the world championship. “I feel like I prepared for this, and it all came down to this race, and I got what I wanted out of it,” Evans said. Her time of 7:16.4 was almost five seconds ahead of silver medalist Lindsey Rust, a member of Friends of Port Rowing. Lightweight boys champion Henry Bellew from Maryland’s Bethesda-Chevy Chase High School appeared in disbelief after his performance: a stunning 6:15.1 that tied his personal best. “Transitioning to world championships kinda heightened the intensity of everything,” he said. “Coming out here with all the guys from my team…it was just an awesome environment to be in.” Bellew, a senior, will row for the Harvard lightweights next year. 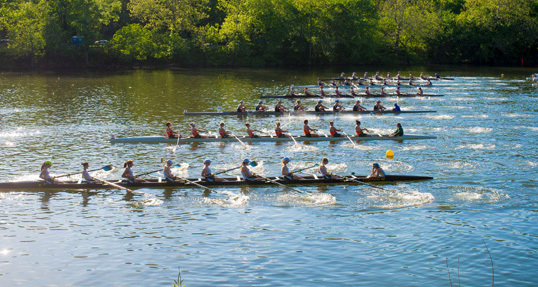 Para-rowing events, marathons, and 2ks for rowers from college-age and upward are the highlight of Sunday’s schedule. Stay tuned for more. Canadian national team hopeful Andrew Todd was at the height of his rowing career when, in one brief moment, everything changed.